An operating system is system software whose main goal is to increase interaction between User and Hardware (Device) so that user feel easier to interact with a Device. 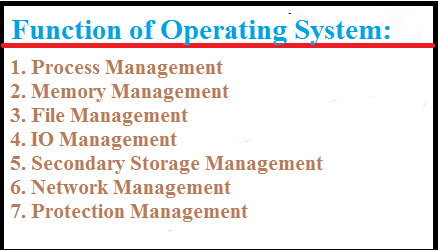 Operating system helps both User and Device in many different ways like OS helps by managing the CPU of a System, Memory Management, and Partitioning, by managing all the files stored in System memory. Likewise Operating system help user with Input-Output Management Function, it helps the user to give input to device more easily and also helps the user by providing the required output after processing the given user input. Operating System also plays the main role in Security, backup, and privacy, OS provides an interface to secure all the files stored on a device and manages the access to those files. The most amazing work and function of an OS are that helps in the management of a network connection to a device. A program under execution is called process. Process management is that function of an operating system in which it deals with running multiple processes on a single computer system. Process management is an integral part of any modern-day operating system (OS). Memory management is the functionality of an operating system which handles or manages primary memory and moves processes back and forth between main memory and disk during execution. Memory management keeps track of each and every memory location, regardless of either it is allocated to some processor it is free. 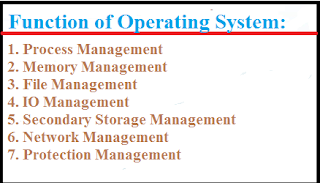 The system that an operating system uses to organize and keep track of files is called a file management system. File management describes the fundamental methods for naming, storing and handling files. It is the duty of an operating system to manage the file in the best and efficient manner.  Users should access all devices in a uniform manner.  The OS, without the intervention of the user program, should handle recoverable errors.  The OS must maintain security of the devices.  The OS should optimize the performance of the I/O system. Since main memory is small and volatile, we need secondary memory. OS is responsible for disk management, functions like free-space management, storage allocation, and disk scheduling. All these functions are referred to as memory management. The operating system is responsible for sharing resources such as files, printers and scanners using either wired or wireless connection; this task of operating system is called network management. The processes in an operating system must be protected from one another's activities. Protection refers to a mechanism for controlling the access of programs, processes, or users to the resources defined by a computer system. A command interpreter is the part of operating system that understands and executes commands that are entered interactively by a human being or from a program. The function of an operating system is to provide an interface for communication with computer. With the help of command interpreter, the user becomes able to instruct the computer. The computer takes instruction from user using command interpreter.